The #ORB Ornamental Roller-Bender is a valuable asset to any metalworking shop. Its wide range of capabilities makes it an essential tool for any shop (including home weekend hobbyist) that has a use for forming metal. Its ornamental and general metal bending capabilities (all incorporated into one machine) are hard to beat with its built in ring roller-especially for a hand operated bender. Its ability to form tubing, roll rings, bend flat stock, solid squares, and solid rounds into numerous shapes, makes it well worth having even for the metal shop that does not fabricate ornamental ironwork. 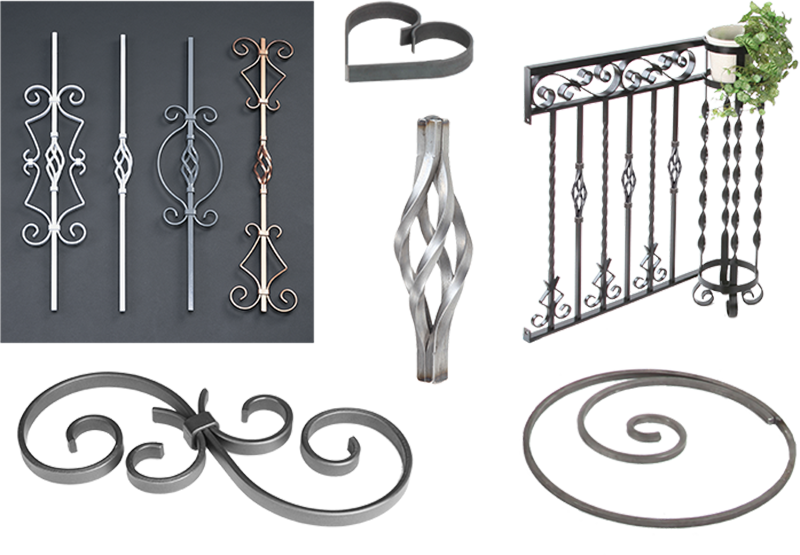 Conversely, if you are in the decorative ironwork business, or are thinking of getting into it then it’s prudent to own equipment that can do more than ornamental. 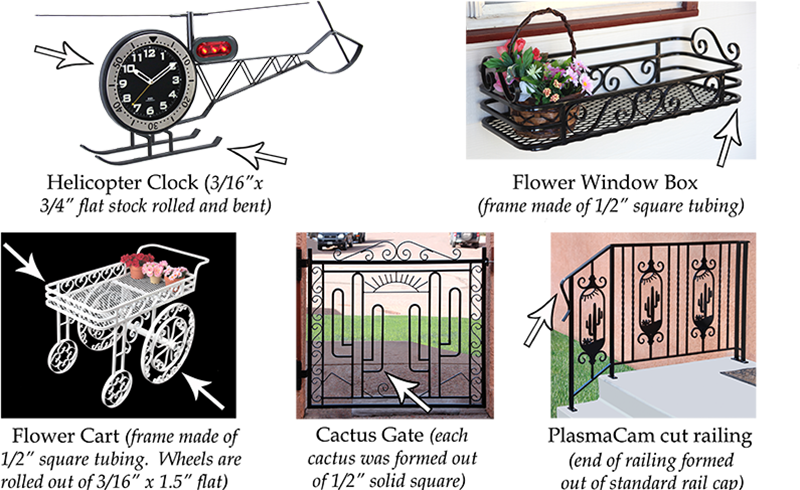 Even if you plan to only make ornamental ironwork there are parts of the various projects that you will find yourself making that not all ornamental ironworking tools are capable of doing. 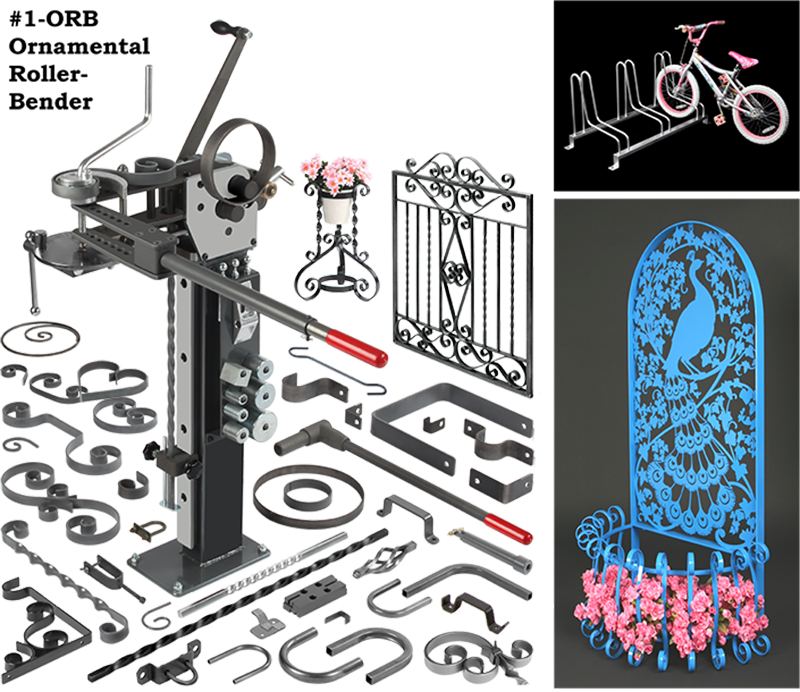 Below are a few examples of ornamental projects that required the extra bending capabilities of the #1-ORB Ornamental Roller-Bender to make. The arrows point to a few such bends which include tubing, rail cap, and rolled circles. Some shop teachers have informed us that their students have built projects with our equipment which they have sold publicly to raise money for additional tools for their shop classes. Industrial arts instructor Carlos Bassett (seen below-from Wyoming) was the first teacher to contact us and let us know the success he had with students making money for the school with their class projects. Pictures of three of those first projects made by his class are seen below. We have had some of Carlos’ students purchase our equipment after graduation having had experience making things with our tools while in school. This teacher obviously instilled an interest in metalworking in a few of his students. One of them even took the time to call me up one day to let me know that he had opened up a welding shop and that our equipment played a major part in his decision to do so. Aside from learning a few of the skills needed to become a good metal fabricator, such as welding and metal forming know-how, the exercise of creativity is good for one’s self worth-which a lot of kids lack. Carlos’ excitement about the fun in making things came through loud and clear when he first spoke with me. Carlos Bassett’s greatest contribution appears to be that of giving his students some direction. 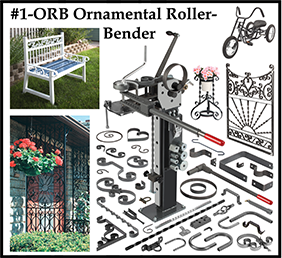 In addition to its general metal bending capabilities the #1-ORB Ornamental Roller-Bender will form an almost unlimited number of scrolls sizes and configurations, make wraps, twist pickets, and form decorative baskets with the use of the optional ornamental attachments. It also does a good job of rolling rings and arches out of hot rolled flat stock up to 3/16”x 1-1/2” and up to 1/4”x 1-1/4”. It will also roll solid round and square up to 5/16”.